Anyone tried the K&N FIPK for GT? They claimed a 12.13hp increase. Anyone tried that and know where to get it (in Canada preferably)? This has been discussed many times. There is no consensus about whether or not it's a worthwhile modification, and whether the engine computer doesn't recalibrate to remove any horsepower gains. I have it. I can't claim any seat of the pants inmprovement like I had on my Impala SS, but I've had no I'll effects either. Get Stage 1 instead. That's got to be the best bang for the buck mod period. It should be everyones first performance mod (until Stage 2 comes out). It's hard to tell the true results with an open air intake system. If you have money to spend, dyno your car before and after the open air system. One thing to keep in mind, going away from the factory closed system, will make it very noisy on high accelerations, since the silencers will be removed. I have an Airaid CAI and plan to switch back to the stock system dyring the winter season, sinc the HP gains (if any) will not be necessary in the snow. As for additional noise, I love the sound of turbo spooling up and that's consider "music"
I doubt it will have the hp gain it claimed. Unfortunately I doubt I'll dyno the car before and after since it's a lot of $$$. I will not go with Stage1. I will be patient and wait for stage 2. I'm with you on waiting for Stage 2. Hopefully we're not waiting in vain. I should have bought stage 1 a year ago. The Typhoon has less advertised horsepower gains then the FIPK. I bought the FIPK. I love it sounds great and with the combination of FIPK and Stage 1. I ran consistant 14.50s at the track four times. 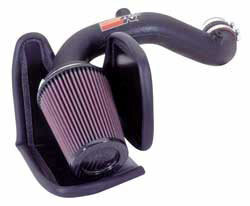 The thing I like about the Airaid Cold Air Intake is that it prevents much of the hot engine air from getting to it. If coupled with a Keystone hood, then you will get more cold air to the Airaid. Not sure where you live, but Stage 1 will not be a great necessity during the winter season. Maybe in the spring or summer is when you may want to consider it. Not sure about waiting for Stage 2, there's lots of speculation of it ever arriving. 4 amxintake stock airbox with 2" ram air line form air duct to fenderwell 14.60, now you know the rest of the story . next week back to the track.